The era of the video arcade game is ushered in with Computer Space in 1971, but few really notice. Pong rights that wrong the following year, and a phenomenon is born. Games like Tank, Gun Fight, Breakout and Sea Wolf prove that video games are no flash in the pan, but Space Invaders takes the craze to a galactic new level. Meanwhile, in the non-video world, a hockey fan turns his passion into a year-round sport with Air Hockey, and Whac-a-Mole lets players work out life’s little frustrations with a padded mallet. The Who’s “Pinball Wizard” launches a new pinball craze, as celebrities from The Harlem Globetrotters to KISS grace the machines’ backglass and playfields. But by the end of the decade, video is clearly the new king, and Asteroids wears the crown. This entry was posted in Arcade and tagged 1970 by Skooldays. Bookmark the permalink. 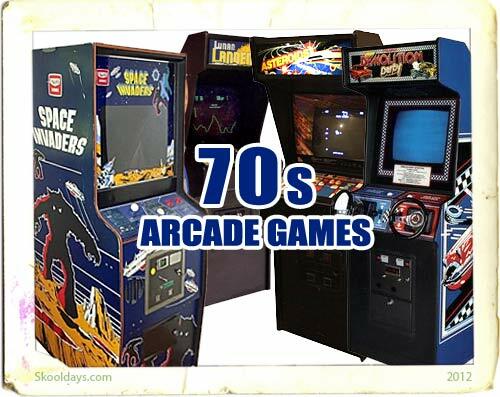 I am LOVING being able to play all the classic, 70’s and 80’s arcade games again. And WITHOUT using a Nintendo style controller either. The Super Retro-cade system by Retrobit is an inexpensive little console with an SD card slot built-in so you can load ALL your favorite games. I have almost TWO THOUSAND games loaded onto mine. And the beauty part is there’s also an reasonably priced ($35-40) joystick controller that’s compatible with the system. Joystick games are meant to be played with a joystick, NOT an SNES controller. Great site by the way. I really dig all the trivia and the history of the games. Always something interesting going on. Thanks and Semper Fi!